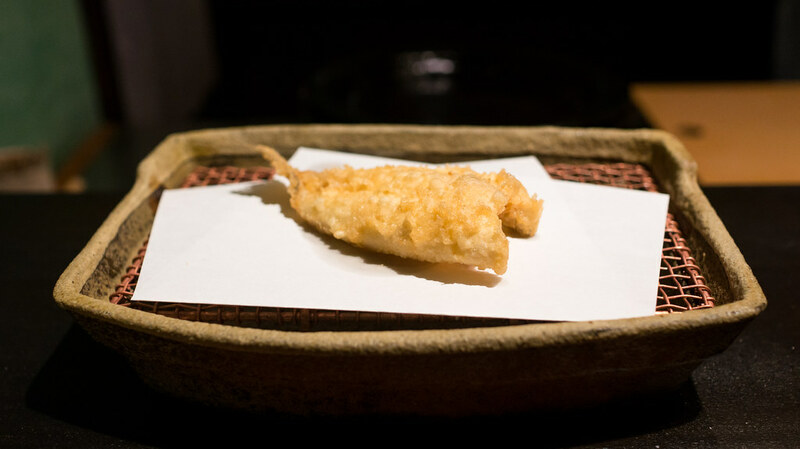 A fileted and split haze (gobe fish) seems to almost float, it's so light and delicate. 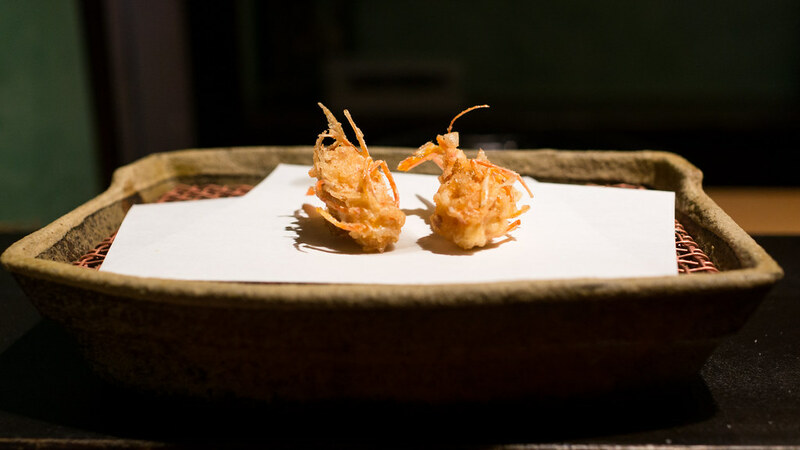 For a bit of a respite from the fried stuff, a light broth flecked with mitsuba bears a baseball-sized dumpling of minced prawn studded with gingko nuts. 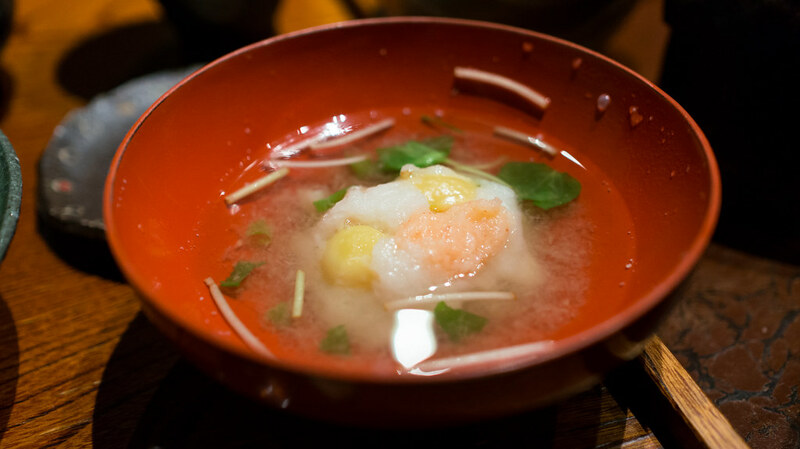 It's like a matzo ball soup from a parallel universe, in the very best possible way. 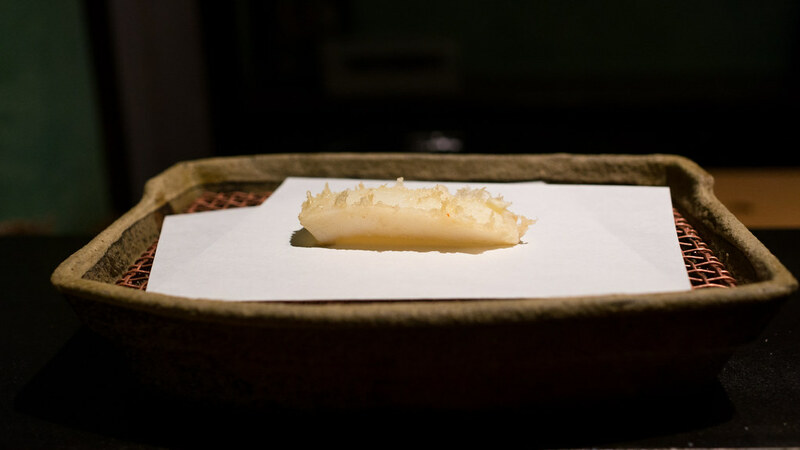 Then for the next course, a plank of ika (squid) may be the best cooked squid I've ever eaten. 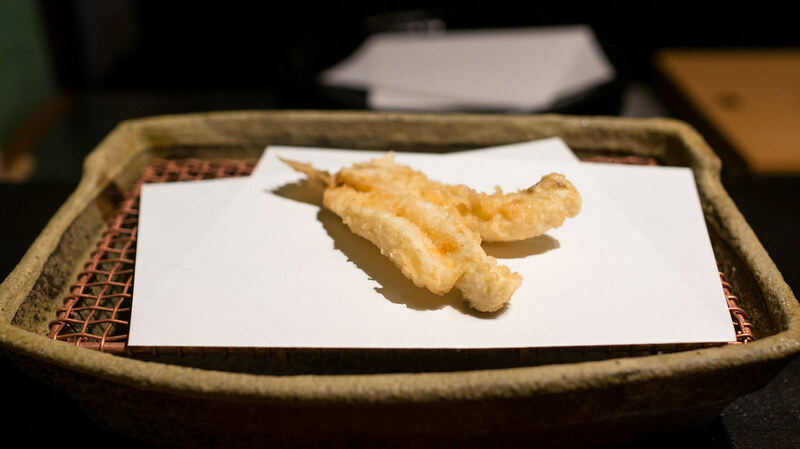 It is the antithesis of the ubiquitous, indistinct, and disappointing piles of "crispy calamari" that plague so many menus of every stripe these days. 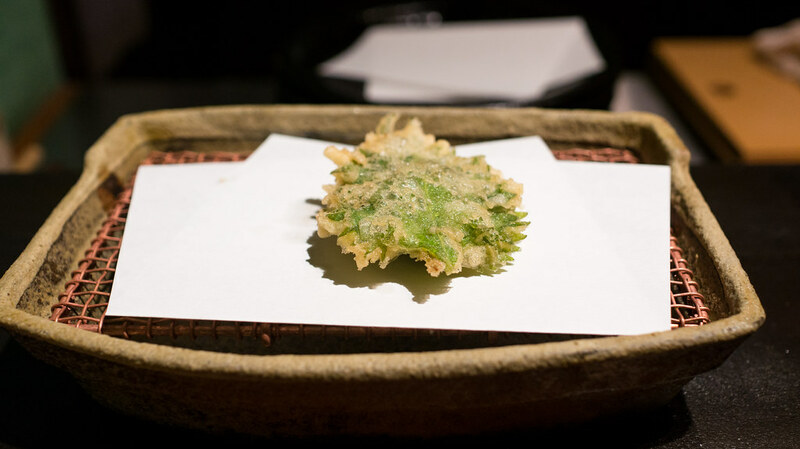 Maybe my favorite item of the night was this "sandwich" of shiso leaves pressed around a generous dollop of uni and then delicately fried - a gossamer tempura shell giving structure to the herbaceous, almost mint-y shiso which held the rich, barely warmed sea urchin roe. 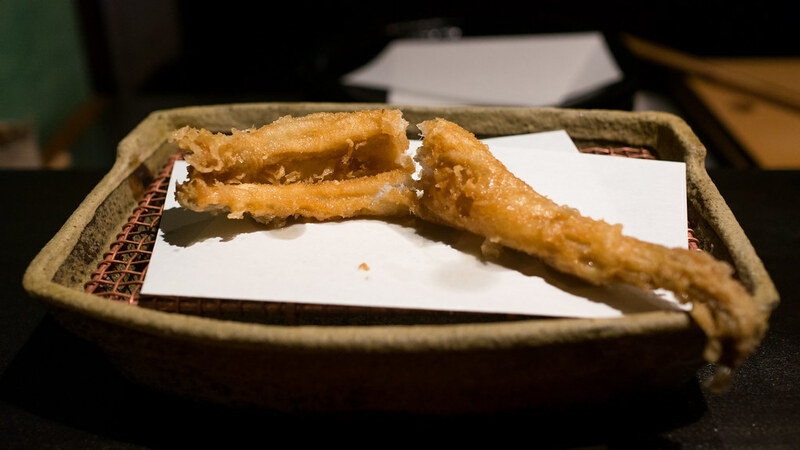 A variety of different items followed, and though each was cooked in the same method, each yielded different textures: the gingko nuts chewy and pleasingly chalky like a chestnut, the tiny shirauo (whitefish) almost crystalline, like perfect little french fries of the sea, the kisu (Japanese whiting) more substantial and meaty. 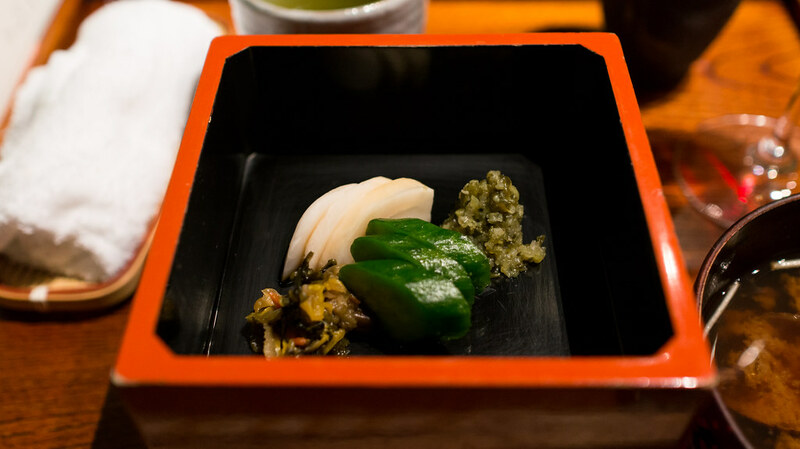 The anago (sea eel) is the most substantial course of the evening, both in size and flavor. 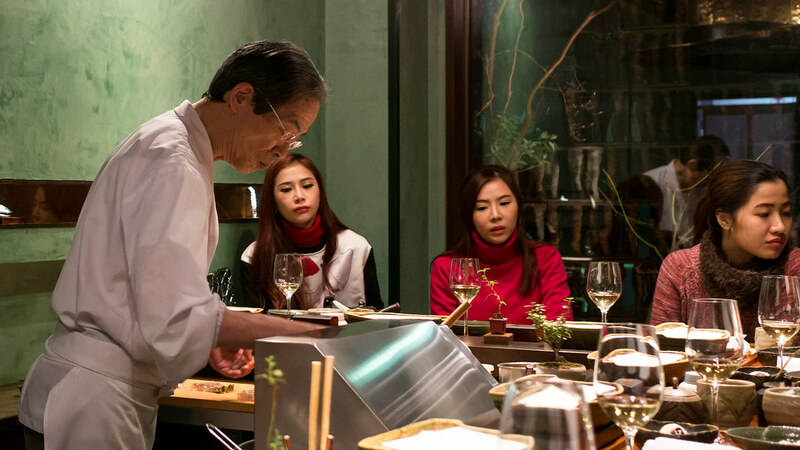 After cooking, the long filet is severed in two with a chopstick by the chef's assistant, releasing a dramatic puff of steam. 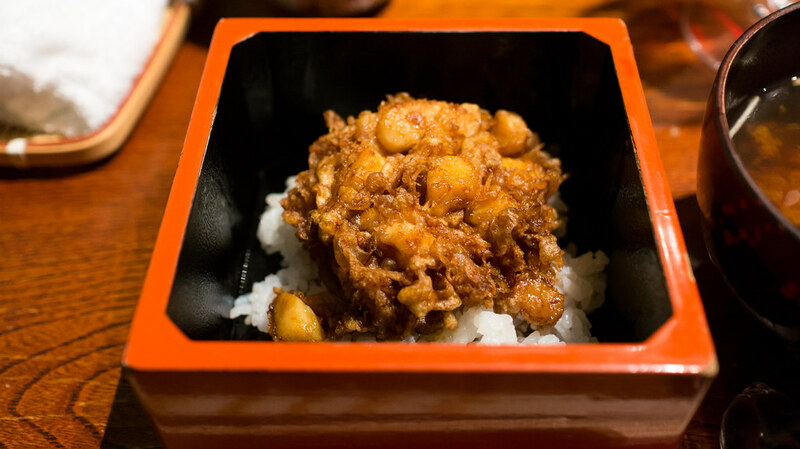 The meat is rich and oily but not heavy or greasy. 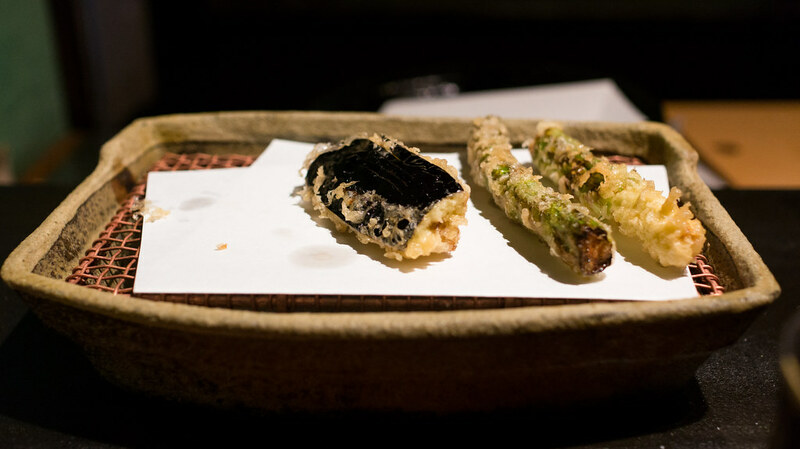 Your choice of two vegetables - shiitake mushrooms, sweet potatoes, asparagus or eggplant - follows. 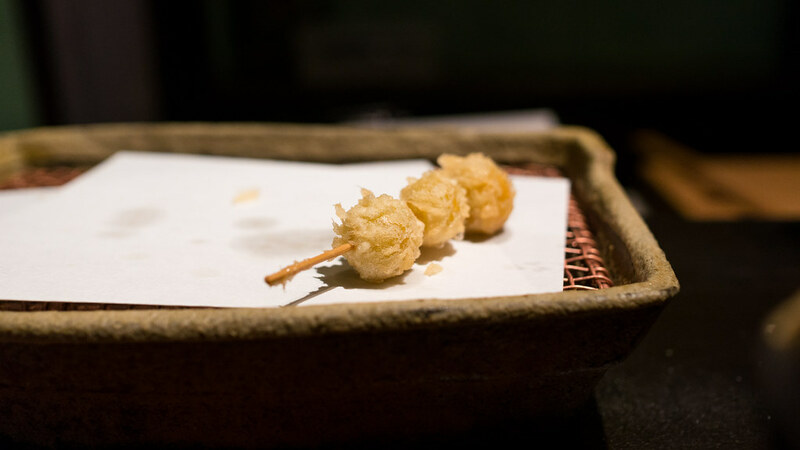 These were actually among my favorite items of the night, managing to soften the vegetables and temper their raw edge without them soaking up a lot of oil. Indeed I wished there had been more vegetables as a contrast to the near-exclusive focus on seafood. 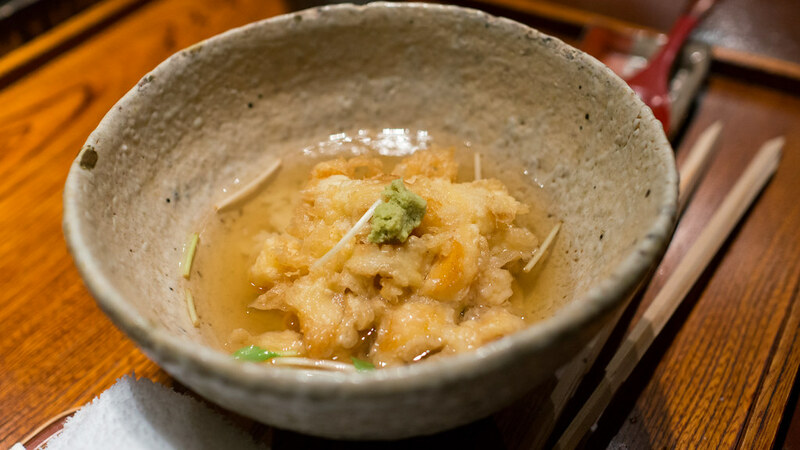 One final savory course remains, and one more choice: you can have your hashira kakiage (a delicate fried ball of small scallops and vegetables) in broth, or over rice. 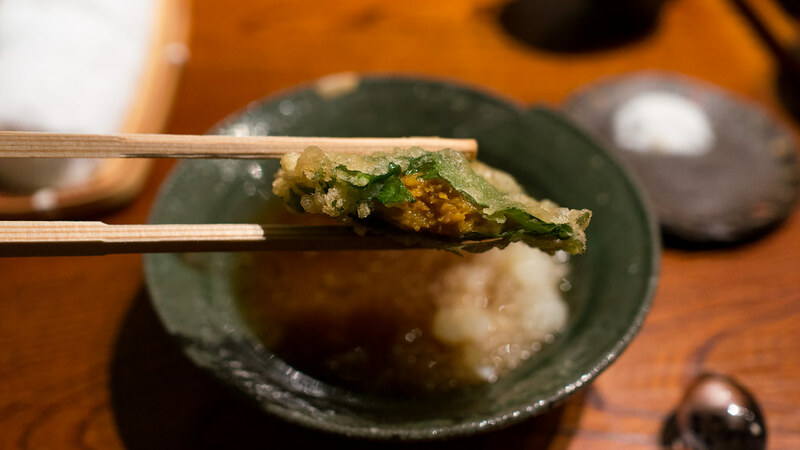 I preferred the kakiage don over rice, made even more hearty by a selection of various tsukemono (Japanese pickles). 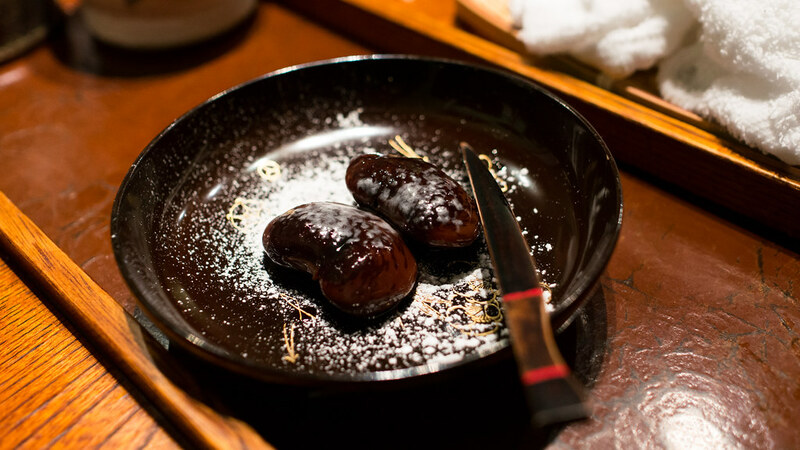 An utterly simple dessert concluded the meal – a couple plump kuromame, shiny black soy beans simmered in syrup. 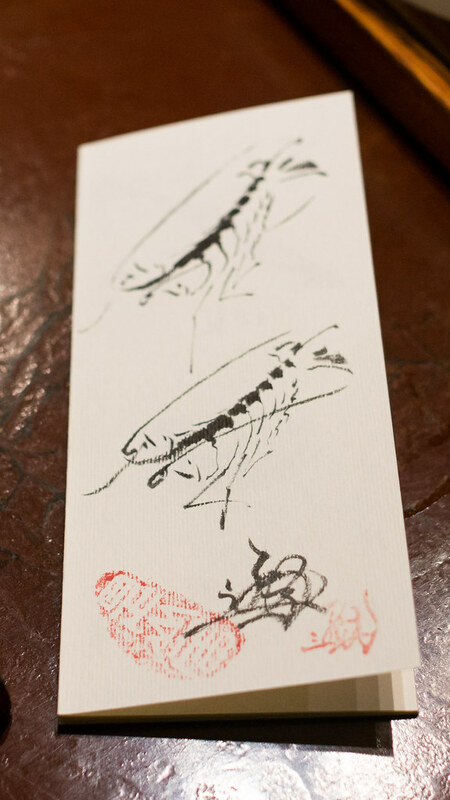 Meanwhile, Chef Saotome took the menu that had been presented on our arrival, and with a steady hand, inked an illustration of the prawns that were served as our first course, then handed the menu back to us. 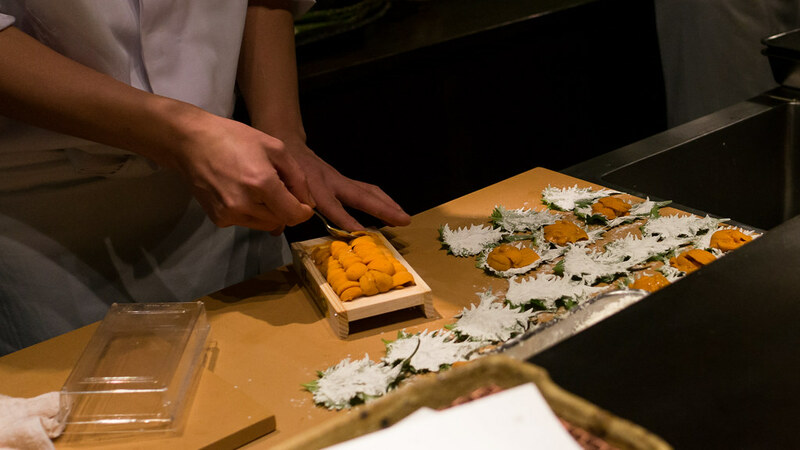 It was such a graceful, elegant gesture – and a beautiful personal touch to an intimate meal. We had the incredibly good fortune to be seated next to a party that included a serious oenophile, who generously shared with us the bottles he had brought - including a 1982 Chateau Montrose, and a 1990 Chateau Figeac. 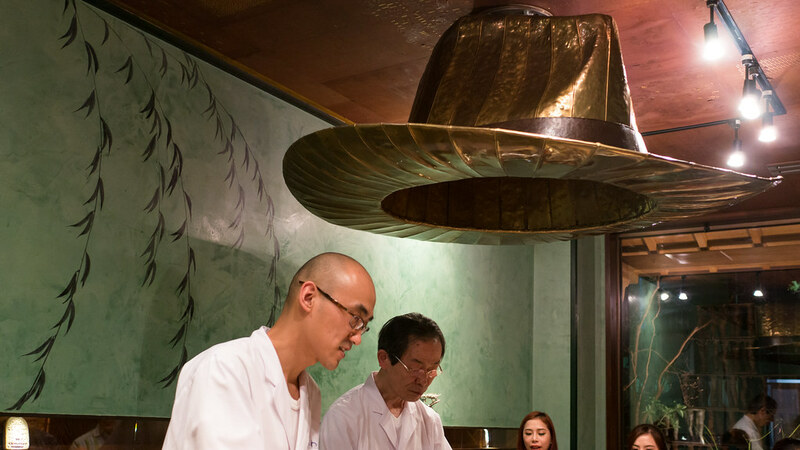 The Bordeaux may not have been the ideal pairing for fried seafood, but the wines, and the friendly company of their owner, were another highlight of the evening. 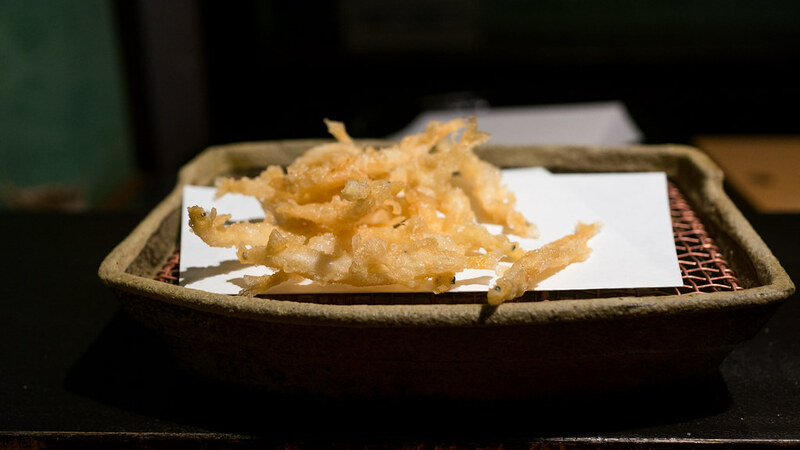 One of my concerns in having a meal devoted essentially exclusively to fried foods is that it would be overly greasy and heavy. I'm reminded of the wedding of a friend of mine who teaches at a university in a small midwestern town. He and his wife had the reception at the local fishing lodge, with dinner catered by the "Chuck Wagon" – a food truck (this was way before the latest food truck craze) that would fry just about anything you could imagine, from chicken fingers to candy bars. The marriage has gone quite well – the following morning, not so much, for me anyway. 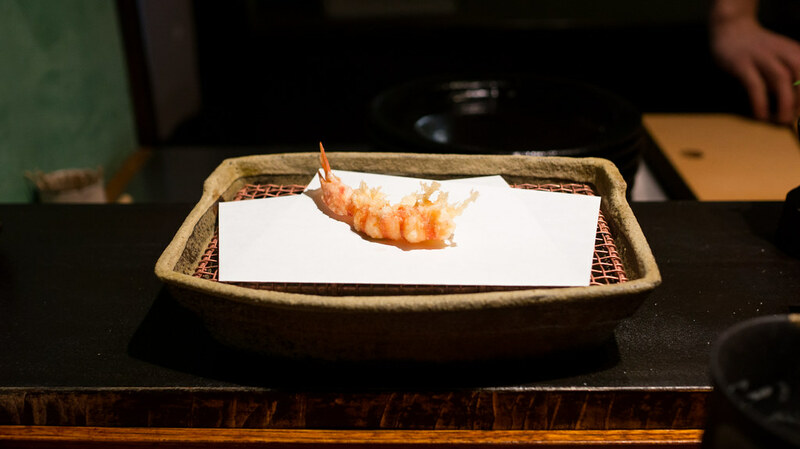 Our dinner at Mikawa Zezankyo was pretty much the exact opposite: everything was light, delicate, clean and almost grease-free. 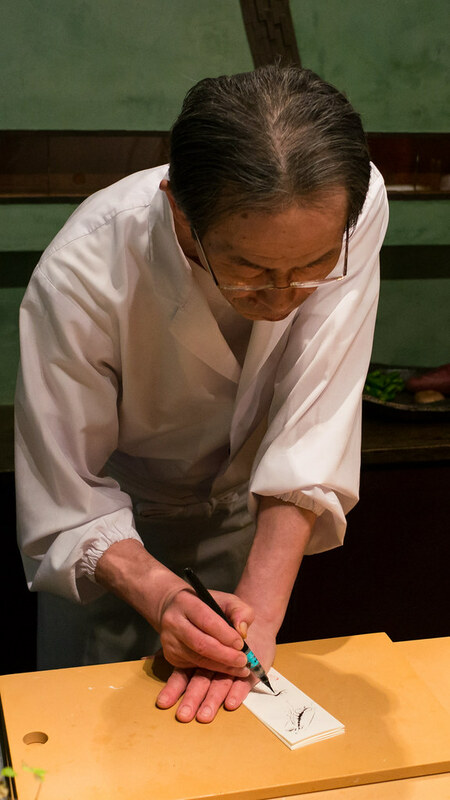 It is not a meal I'd eat every day, or even every week; but it was great to experience the work of a real master at his craft. 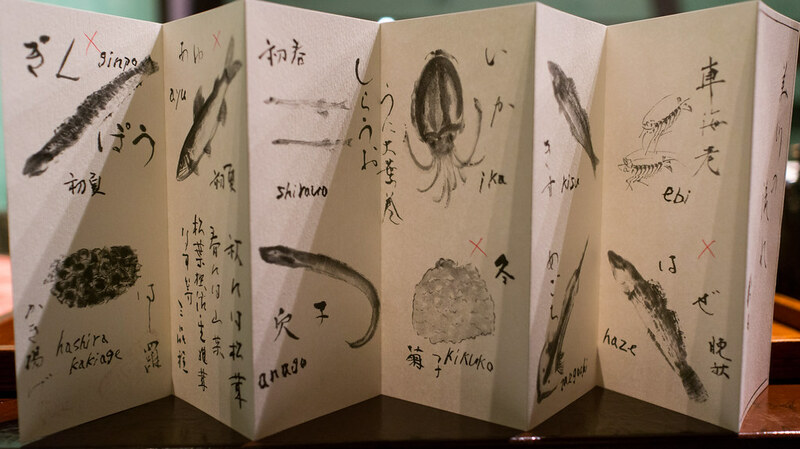 My favorite local izakaya here in South Florida has about 150 items on the menu, excluding the nigiri selections. 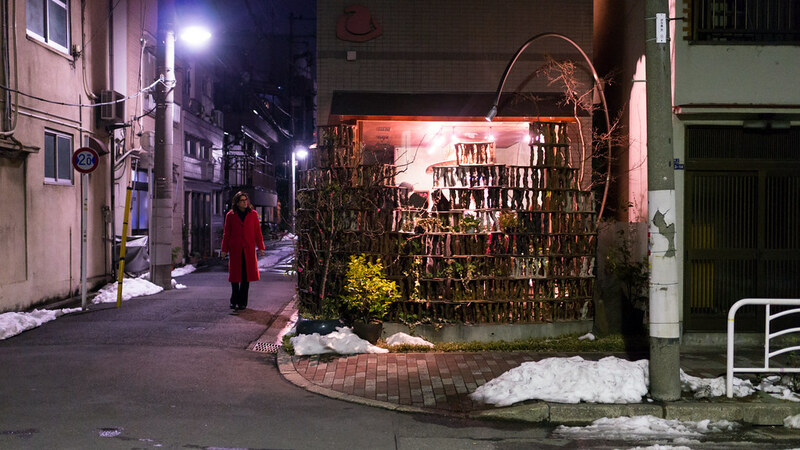 I'm the company that you meet in Mikawa. We're enjoy so much food incredible. Shop also nice and clean. 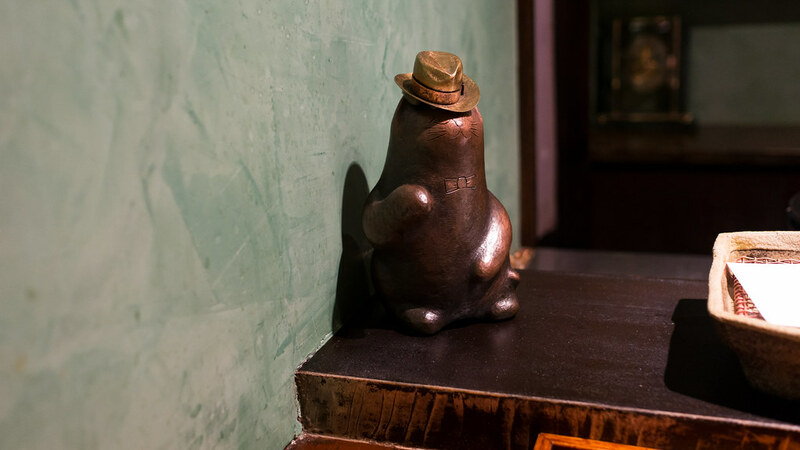 I'll be back when I'm in Tokyo.